On May 22, 2011, one of the nation’s most destructive tornados tore through Joplin, Missouri, destroying two elementary schools, one middle school, the high school and the Franklin Technology Center. This week marks a great milestone for Joplin, Missouri, one that we are proud, yet humble to be apart of. Our journey started with a promise Superintendent CJ Huff made to the Joplin community: “School will start on time next August”, just days after the tornado. Our team was brought on to rebuild The Franklin Technology Center. This was the district’s most complicated project, because it was more than just school with classroom walls and smart boards. It was essentially 8 small businesses that would have to be retrofitted inside an existing 50,000 S.F warehouse. This retro fit was massive undertaking, considering the 90 day schedule to design, bid and construct the project. The Franklin Technology Center program included Nursing, Auto Tech, HVAC, Welding, Culinary Arts, Drafting, Construction Tech, Computer Tech and also housed administrative staff. These complicated spaces paired with fast paced schedule, made for some late nights as plans were being drawn in many cases dayst before the contractor would start construction. Our team, along with many hard-working dedicated consultants, suppliers, contractors, & owners representatives, were able to complete the project in under 80 days, adhering to Joplin’s promise that school would start on time. Pam Haldiman, Architect and Project Manager at Sapp Design was awarded a National Association of Woman in Construction “Vesta Award” for her outstanding dedication to this project. After several rounds of interviews, Sapp Design was selected for the Irving and Emerson Elementary project. 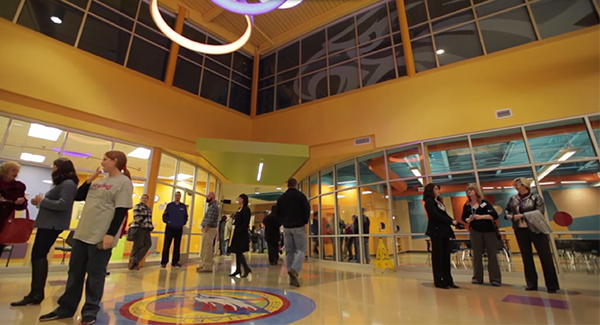 The new elementary school combines both Irving and Emerson into one new 21st Century Elementary School. The idea was not to just build back, but to build back stronger. Irving Elementary features two integrated FEMA safe rooms that will provide near absolute protection during an EF5 tornado. These FEMA safe rooms can house the school’s whole student population and over 800 people from the surrounding community, while serving a duel purpose as specialized classroom spaces and the school’s main gymnasium. As part of the design process the kids were directly involved in picking many of the colors and shapes that can be seen in the new building. The school features adaptive learning spaces that promote collaboration and flexibility. The collaborative learning spaces or “learning parks” at Irving are wide hallways that help teachers to share resources or teach in large groups. 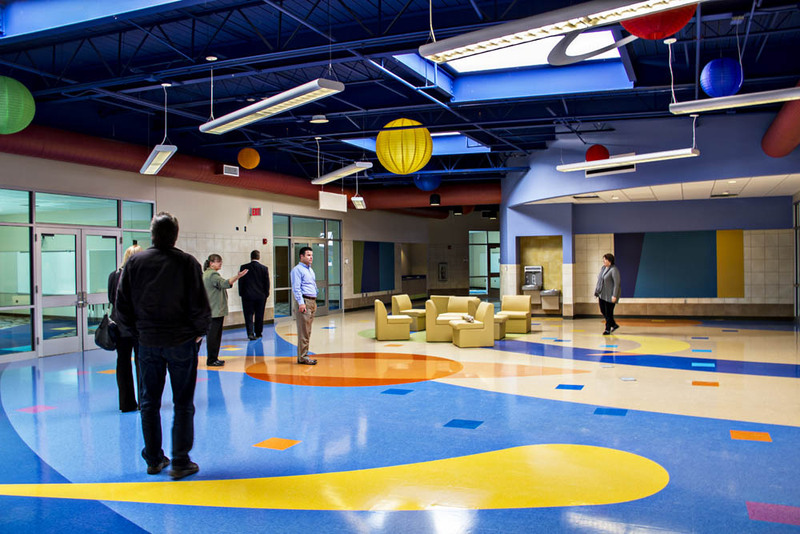 Each learning park is themed, with lots of color and natural light to enhance the overall learning experience.